The No. 15 Seward County Lady Saints finished their non-conference slate on Friday, defeating the Mesa Lady Thunderbirds 73-62. 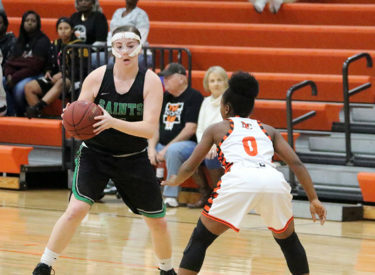 For the second straight year, the Lady Saints finished the non-conference schedule with an unblemished record, going 4-0 in the matchups this year. Seward County (11-2, 7-2) used an impressive second quarter showing to take a decisive lead in the game. After ending the first quarter tied at 15, the Lady Saints outscored the Lady Thunderbirds 21-10 in the second quarter to go into halftime with an 11-point lead. By the end of the third quarter, the Seward extended their lead to 16 points after outscoring Mesa 21-16 in the third quarter. The second quarter ended up being the difference maker, as the Lady Thunderbirds made up the difference of the third quarter by outscoring the Lady Saints 21-16 in the fourth. The 11-point halftime differential was too much for Mesa to overcome however, as Seward came away with the 11-point victory, 73-62. The Lady Saints finished the game shooting 32.4 percent from the field and 34.6 percent from behind the arc. Mesa was on par with Seward from the field, shooting 34.4 percent, but couldn’t buy a shot from behind the arc, connecting on just 13.6 percent from deep. Three Lady Saints scored in double figures – Mollie Mounsey (18), Amy Scott (14) and Lexi Hernandez (11). While Mounsey and Hernandez started the game, Scott served as a much needed 6th man for the Lady Saints. Seward forced Mesa into 15 turnovers, with 13 of them coming off steals. Silvia Veloso led the Lady Saints defensive effort with four steals, while Vilma Covane, Sidney Tinner and Mounsey all came away with two. After traveling to Arizona with a -0.5-rebound margin, the Lady Saints will leave with a 4.2 margin following a 54-42 rebounding advantage over the Lady Thunderbirds. Carla Covane (11 reb.) came away with double-digit rebounds, while Mounsey (9 reb.) came one shy of a double-double. The Lady Saints will return to the Greenhouse on January 3rd to take on the Independence Pirates at 6:00 p.m. The game will be free for all fans thanks to our sponsor Bank of Beaver City.